Figure 1, above has been generated by our CAD software. The sash an the right only exists virtually in my computer. 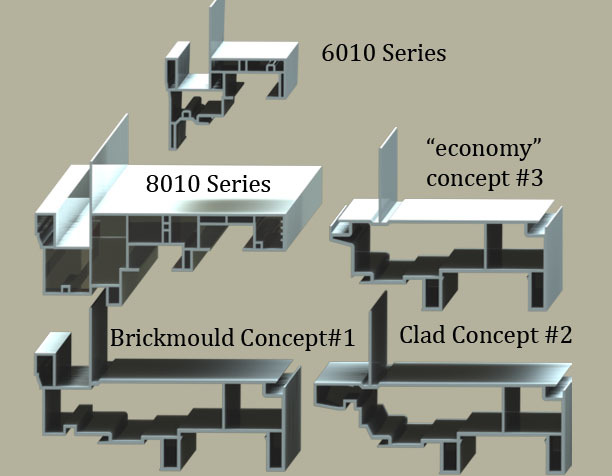 On the left is a rendering of our 6010 series Single hung. The one on the right has a 1.500 overall (OA) glass package, and on the left, that unit has a 3/4 OA glass package. We have real test data for 6010 series and the window is capable of U-value of 0.31 (R-value 3.22) with Cardinal 270 Low-E on the 2nd or 3rd surface. This is pretty much the standard available in the market today. With Low-E on both the 2nd and 3rd surfaces we will achieve roughly a U-value of 0.20 (R-value 5). That’s a bit of a stretch, but it is achievable. (To find out, all we will need to do is pay some fees to the testing laboratories and the can confirm the numbers.) Really though, we don’t need that because we have enough experience and know that the window will test around these numbers. We also know that 99.99% of the windows sold in the USA will pass these numbers if the glass package is 3/4 OA. If we are trying to evaluate a future window suffice it to say that it does not matter what the window frame is made out of, they are all going to resist heat transfer about the same. The only exception is an aluminum frame which is not nearly as energy efficient as wood, fiberglass or vinyl (even if thermally broken). With SSB glass the 6010 has a “dead air” space of 0.5625 (9/16″=3/4-3/32-3/32=0.5625). This happens to be the optimum dead air space in order to resist heat transfer. On the virtual window I applied common sense. I designed a window with two dear air spaces of 0.5625 and I also upgraded the glass to DSB (i.e., 1/8 glass, or, AKA 0.125 glass). Using this as design criteria means the OA glass would be 1.500 OA (1.500=0.125+0.5625+0.125+0.5625+0.125). I called the Cardinal Glass technicians and they told me that a 1.500 OA unit with Cardinal 366 on the 2nd surface and Cardinal 170 glass on the 5th surface would yield a U-value of 0.1389 which is an R-value of 7.2. These numbers give a base line on predicting future performance that is available given today’s Low-E glass technology –and the given design mission. In Figure 2 I show a concept of the 1.500 OA mainframe on the right and the 6010 series mainframe on the left. You can see there is a massive difference in the overall size of the mainframe. Consequently the cost of this window will be significantly more. For those of you that noticed, yes I designed this concept to be a “take out” sash. This goes against the current market staple of a “tilt-in” sash. The reason that I designed it that way is two-fold. First with triple pane glass the sashes have the potential to get very heavy. With the take-out sash we eliminate the “easy tilt” (tilt-in) feature but we gain in less potential of the sash causing issues because of the shear weight of the sash. 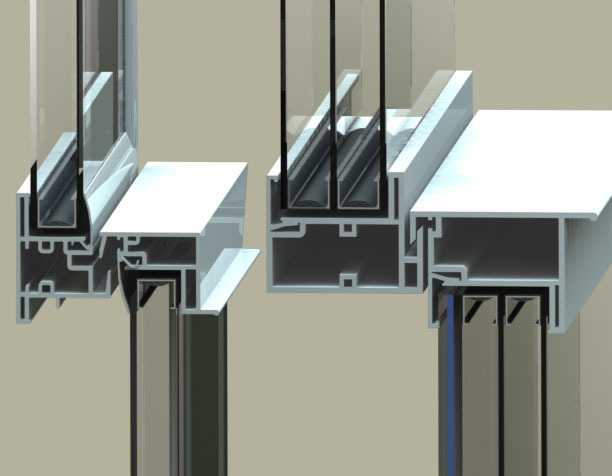 The second advantage of the take-out sash is that it will pass a much higher structural load, which would make this window very well suited for heavy commercial (HC) applications. 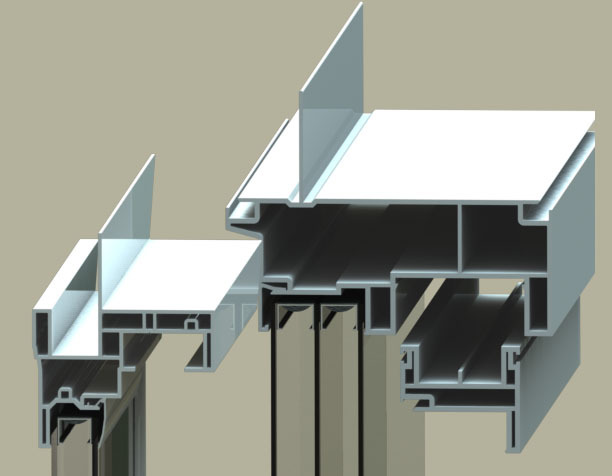 This window would be able to be installed in high rise multi-family applications. Coupled with a paintable exterior, I think this would be a real winner. The trouble is: it will require a massive capital expenditures. When you factor in extrusion tooling and fabrication tooling, we are looking at close to a $750,000 capital budget. There’s one more advantage to designing the window to be “take-out” and that is the mainframe is already set up to build a slider, which is also an nice niche in the commercial market. Figure 3 shows a bunch of possible mainframe ideas. The overall frame depth for Versions #1 and #2 is 6.075 inch and the overall for Economy Version is 5.266 inches. Of course that is subject to change–they only exist now in my head and on my computer. I have included a rendering of our 8010 so that you can get a relative scale of these beasts. I have presented a “economy” version, a 180 Brickmould version and a contemporary clad version. These designs are all single hungs. Any one of the designs would be one fantastic window! Joe just read the article and walked into my office and wanted me to comment on the advantages of STC jobs. This window design would facilitate very good STC (Sound Transmission Class) numbers. Our best preliminary guess is that any one of these concepts could produce an STC rating of around 35: possibly higher. This window would open a lot of doors–pun intended. Comments on this post are very much encouraged for marketing reasons. This entry was posted in Painted Vinyl Windows, Vinyl Windows and tagged heavy commercial applications, multi-family applications, paintable exterior, painted vinyl, vinyl windows. Bookmark the permalink.